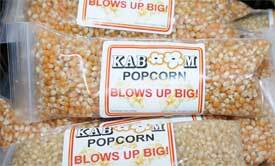 Kaboom is nothing but the corn with no additives or chemicals in growing or processing. Kaboom is sealed for freshness and ready to pop. Store your popcorn in the freezer until you are ready to pop. Use a smaller amount of Kaboom the first time. It BLOWS UP BIG!